One summer night in 2006, in a beautiful neighborhood restaurant, a young man asked his girlfriend for her hand in marriage. Nervosity did not allow them to enjoy the enchanting surroundings or the meal, which they remember vaguely to be delicious. Eight years later, motivated by a memory, I had to come back to truly appreciate it. I remember now. A pergola worth a 1000 pictures; friendly staff; an octopus salad that takes you back to your latest Spanish vacation; and a filet of beef that melts in your mouth. Kreis 6 is your perfect local restaurant if you want to escape the crowds. They have been around for a while and the quality of their food has not changed. My obsession with octopus forced me to order it again, and it is one of the best I’ve had. According to my date, his lamb rack was not only flawlessly cooked, but the ratatouille that came along was the perfect match to the gnocchi, which tasted as if prepared by an Italian grandmother in Tuscany. To close the evening, we went for a strawberry mascarpone gratin, a sinful marriage of strawberries, sour cream ice cream and light mascarpone. 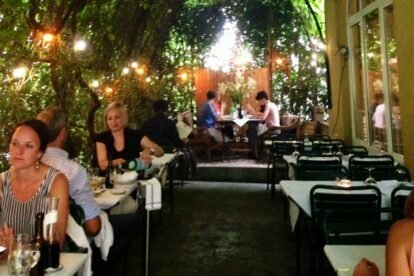 Also, the beauty of the pergola accompanying our meal was not something you find easily in the city. A full treat to our eyes and bellies. It took me 8 years, two times and many memories to appreciate it, but now I see it clearly. Kreis 6 is slowly becoming one of my favorites in Zurich.